(16/45) TRENTON – The Christie Administration marked a milestone in its efforts to reduce combined sewer overflows in urban areas by providing a $1.2 million interest-free loan for Elizabeth for planning a long-term control effort to reduce discharges of wastewater and stormwater that occur during heavy rainfall, Department of Environmental Protection Commissioner Bob Martin announced today. The 10-year loan, provided by the New Jersey Environmental Infrastructure Trust in partnership with the DEP, is designed to help communities develop innovative strategies to reduce pollution from combined sewer overflows that impair waterways as part of a new DEP permit process adopted July 1, 2015. It is the first planning loan issued as part of a new DEP permit program to improve urban water quality by addressing combined sewer discharges. Many of New Jersey’s older urban areas, particularly those in the densely populated northeastern part of the state, use combined sewer systems, which are shared underground piping networks that direct sewage and stormwater to a central treatment plant before being discharged into a water body. 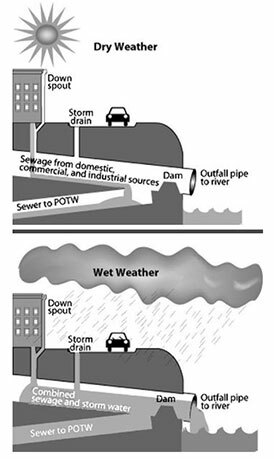 During heavy rainfall or significant snowmelt, the systems overflow, causing discharges of mixed sewage and stormwater. The new permit systems enables operators to develop long-term control strategies that include gray infrastructure projects, such as holding tanks to store stormwater for later release, and treatment plant expansions. The permits also encourage green infrastructure projects, such as rain gardens and green roofs, to divert stormwater before it enters the sewage piping networks. Elizabeth has already received nearly $762,000 of the loan as reimbursement for costs the city has incurred to date. The federal Environmental Protection Agency supports New Jersey’s approach, recognizing that urban communities need proactive and innovative approaches to be able to address a problem as large and complex as combined sewer overflows. There are more than 200 CSO outfalls in New Jersey. CSO permit holders have long been required to maintain control technologies at outfalls to collect solids and trash before entering waterways. The new permit system will reduce the number and amount of CSO discharges, thereby reducing pathogens and other pollutants to waterways. As part of the state’s new approach, municipalities and system operators also must implement enhanced public notification strategies, including providing real-time information on potential discharges into rivers and other waterways. As the first step in the new permit process, permit holders have been required to post identification signs at discharge points stating there may be sewage overflows during and following wet weather, with the possibility that contact with the water may cause illness. The permit holders must also provide leaflets, fliers and signs at areas dependent on waterways, such as marinas, docks, and fishing piers, as well as set up telephone hotlines or websites to provide real-time discharge information. Municipalities and authorities that hold CSO permits through the New Jersey Pollutant Discharge Elimination System (NJPDES) are: The Camden County Municipal Utilities Authority; the City of Camden; Gloucester City; the Trenton Sewer Authority; the Joint Meeting of Essex and Union Counties Sewerage Treatment Plant; Elizabeth; the Middlesex County Municipal Utilities Authority; Perth Amboy; the Bergen County Utilities Authority; Hackensack; Ridgefield Park; Fort Lee; North Bergen Woodcliff Sewage Treatment Plant; Guttenberg; the North Hudson Sewerage Authority’s Adams Street and River Road wastewater treatment plants; the Passaic Valley Sewerage Commission; the Bayonne City MUA; the Jersey City MUA; the City of Newark; the North Bergen Municipal Utilities Authority; East Newark Borough; Harrison Town; Kearny; and Paterson. In order to encourage regional collaboration on planning and development of projects, permit holders who agree to work in partnership with other permit holders have up to five years to develop one consolidated plan. Those who choose to submit individual plans have up to three years. This approach gives communities an opportunity to establish their priorities, spread costs over time and integrate planning with other community improvement goals, such as green space development, flood prevention, traffic mitigation, and property value enhancement.